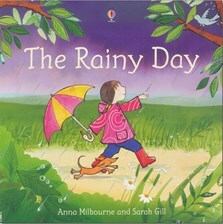 Bright watercolour illustrations and evocative text lead very young children through the events of a rainy day: from cloudy skies to the 'splish, splash, splosh' of puddles and beautiful rainbows. Woven into the story are descriptions of creatures that need and enjoy rainy days, such as frogs, birds, worms and snails. This book is not only fascinating for kids but for us adults too. I love how it tricks them into learning something! It's wonderfully written and the illustrations are simple and wonderful!